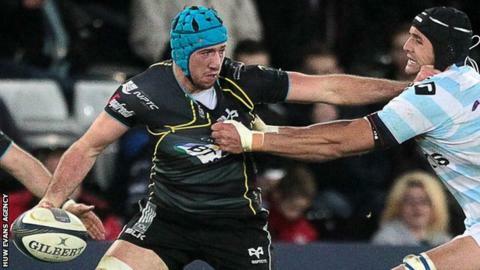 Ospreys coach Steve Tandy says they are in contract talks with their Wales flanker Justin Tipuric. The open-side's current deal expires at the end of the 2014-15 season and he has been linked with a possible move to English Premiership club Leicester. "We are just ongoing, talking to Tips [Tipuric] and hopefully it will be resolved soon," said Tandy. Ospreys recently signed Wales flanker Dan Lydiate on a dual contract with the Welsh Rugby Union (WRU). Tandy did not confirm whether Tipuric, 25, could also be secured on a joint deal with the WRU. Lydiate was the second Wales and British and Irish Lion to sign such a contract, joining Tipuric's Wales open-side rival Sam Warburton - the national team captain - on a contract that limits players to 16 regional games per season. The WRU provides around 60% of dual contracts with the regions paying the rest via a £3.3m fund that was agreed in August 2014. Warburton hopes more leading Wales players sign dual deals in the wake of former Newport Gwent Dragons star Lydiate's move from French club Racing Metro to Liberty Stadium. Dragons coach Lyn Jones also said Wales number eight Taulupe Faletau, utility back Hallam Amos and centre Tyler Morgan were offered dual deals.